Taking a moment: Joan Goodger on the Great Wall of China. So proud: Joan was given a medal by Global Adventure Challenges, which organised the trek. 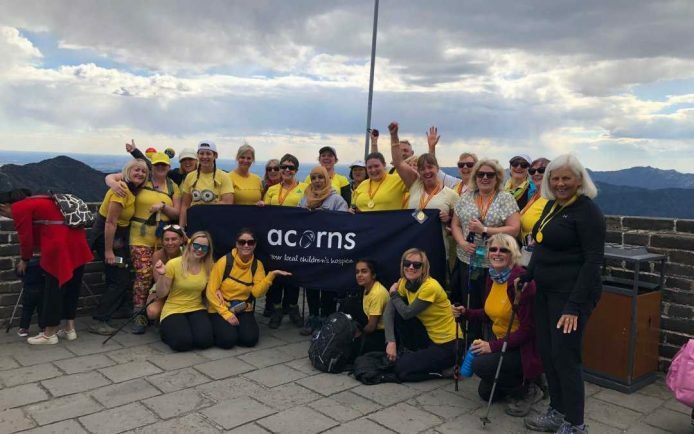 All in yellow: The Acorns team wore yellow to remember one bereaved parent’s child. 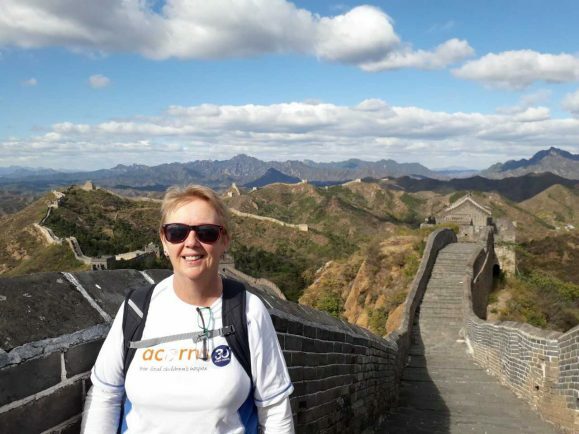 A Rubery woman who walked the Great Wall of China in memory of her son has helped raise £65,000 for Acorns Children’s Hospice. Joan Goodger, aged 61, says she can ‘never do enough’ for the hospice which looked after her son Paul before he passed away, aged just 12-years-old. “He was diagnosed with an inoperable brain tumour,” she said. “It was very tragic but the nurses at Selly Oak’s Acorns Children’s Hospice were absolutely incredible to us. “I did this for them. Joan was joined by 24 other fund-raisers from around the UK to raise money for Acorns. The group had met up a few times before starting the trek, spending their time swapping stories and explaining their reasons for wanting to give back to the hospice. After transferring from Beijing on October 5, the group made their way to Huangyaguan 130km to the east of the Chinese capital and explored the military barracks complex which is still linked to the wall. 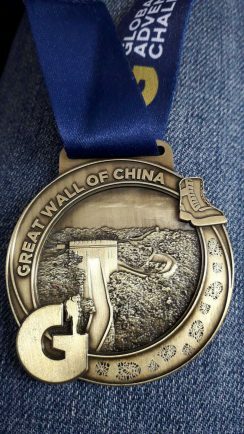 “From there we walked to Gubeikou village which is the East entrance of the Great Wall and is along the Taipingzhai section,” said Joan. “It was tough four hours but that was just the start. Despite clear blue skies, the group had to deal with a flurry of snow as they climbed higher. “The most beautiful part of the wall was as we entered Mutianyu. It offered a spectacular view of China’s landscape,” said Joan, who lives in Rubery. In between trekking, the group took time off to visit nearby Chinese tea-tasting cafes, a silk factory and acrobatic show. Joan was not the only bereaved parent to go along and, in a touching moment, the walkers honoured another parent’s daughter by wearing only yellow, which was the child’s favourite colour. At the Juyongguan section of the Great Wall, Joan’s group was granted exclusive permission from the Chinese Government into an area which is currently being repaired. The fund-raisers spent a total of five days doing as much as they could before eventually travelling back to the UK on October 10. On October 26 Paul’s former school, Rednal Hill Infant and Nursery, helped add to the fund-raising pot by organising a non-uniform day where the children dressed in Halloween costumes. “I’m very thankful for everyone who put so much effort into raising money for the hospice and the excellent work they do,” said Joan.